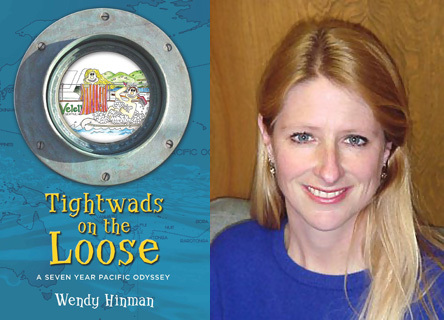 Voyager Wendy Hinman will share stories and photos from her 7­-year, 34, 000 ­mile sailing adventure aboard a 31-­foot sailboat and sign copies of her book, at the Woods Hole Public Library on Monday evening June 22 at 7:30 PM. “Tightwads on the Loose: A Seven Year Pacific Odyssey” takes readers on a high seas adventure. 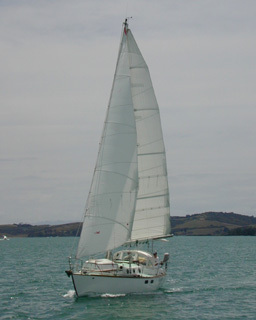 It tells the story of Wendy and her husband Garth, lured to sea by the promise of adventure. They buy a 31­-foot boat that fits their budget better than it fits Garth’s large frame and set sail for an open-ended voyage, never imagining they’d be gone seven years, or cover 34,000 miles at the pace of a fast walk. They live without most “necessities” and learn that teamwork and a sense of humor matter most as they face endless “character-­building opportunities.” They make a long­anticipated visit to the island where Garth had been shipwrecked as a teenager, only to find it has become a penal colony. An electronic catastrophe in the Solomon Islands leaves them without navigation equipment, which forces them to trade their free­-wheeling lifestyle for one that seems straight out of a ’60s sitcom: at a U.S. Army base in the Marshall Islands. In Asia, they dodge typhoons and ships that threaten to turn their home into kindling. Finally they endure a grueling 49-­day nonstop ocean crossing. But none of this prepares them for their arrival “home” to a post­-9/11 America which leaves them wondering what had changed more, them or the world. This story appeals to adventurers, travelers, and sailors—even those who haven’t ventured far; those seeking a simpler life; and anyone with a sense of fun.